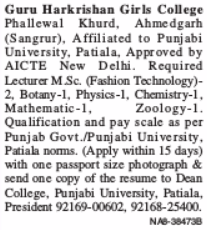 Guru Harkrishan Girls College, Ahmedgarh has advertised in TRIBUNE newspaper for the recruitment of Teaching Faculty- Lecturers jobs vacancies. Interested and eligible job aspirants are requested to apply within 15 days from 19th Sept 2018. Check out further more details below. About College: GHGC Phallewal, is a premiere Management & ComputerTechnology Institute established in 2000. It is situated on Ludhiana-Malerkotla Highway, in the lap of lush green pollution free environment. GHGC is a Group of Educational Institutes exclusively for girls. GHGC is affiliated to Punjabi University, Patiala & approved by AICTE New Delhi Offers MBA, M.Sc (IT), MA (English, Punjabi, History), PGDCA, BBA, BCA, B.Sc. (FashionTechnology), Bachelor of Journalism & Mass Communication and B.A. GHGC has been in the forefront of providing quality education since its establishment with student strength of 1100 till date. How to Apply: Interested and eligible candidates are requested to send application along with CV, copies of certificates and recent passport size photos to the postal address given below. Reference: Advertisement from Guru Harkrishan Girls College, Ahmedgarh on TRIBUNE newspaper dated 19th Sept 2018 for the recruitment of vacancy position such as Lecturers faculty jobs. See the copy of advt below.